Mondays Finish the Story. Picture + half a sentence = fun flash fiction. 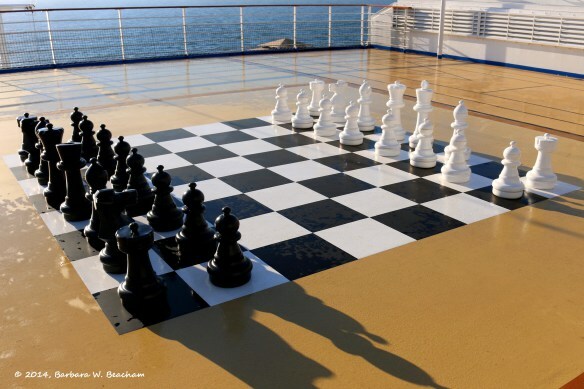 And I’d agree if you’re talking about this chess board on my annual Caribbean cruise. Notice what’s missing? Same thing that’s missing in my life. Well, to hell with it. I’m changing my dream. No more life like a chess game. No more white knights. I’m switching to the other side of the board. Great take on this prompt. Very well crafted. I noticed the piece missing. Should have continued my train of thought. Nice job! Your story is provoking the way it is though. I like that different folks have such different takes on a prompt. Part of what makes the writing challenges so much fun to read. Very nice! Great use of the missing piece (I managed to slip that into mine too). Sounds like your protagonist has had enough of playing by the rules. Cool how spotting that missing knight prompted both of us to use it in the story. I enjoyed your take on it too. Enjoyed the story. Wonder what she will do to get her knight? I wonder too. Isn’t that funny how you can create a character in a brief sketch of 150 words, and it’s enough to make you continue the story in your head? That is the cool part of Flash Fiction. I like this use of the image, I can understand the desire to change sides. Well done. Thanks Summerstommy. I sort of wonder myself which side she’s switching too…I left it open for interpretation. Mara goes over to the Dark Side–she’s looking fir a Black Knight–showin’ your wild side, Gurl!